de ultima generatie. Din aceasta combinatie rezulta produse de calitate premium. variabil ceea ce permite schiatul si coborarile in conditii diferite de zapada. Optisch wirkt der La Sportiva GT 2.0 fast schon klassisch – so ohne Rockeraufbiegung an der Spitze. Doch durch die harmonische Abstimmung gleitet der La Sportiva geschmeidig und präzise durchs Gelände. In engen Turns kostet er jedoch spürbar mehr Kraft. Ein Allrounder für athletische Fahrer. Doch durch die ha Abstimmung gleitet der La Sportiva geschmeidig und präzise durchs Gelände. In engen Turns kostet er jedoch spürbar mehr Kraft. Ein Allrounder für athletische Fahrer. 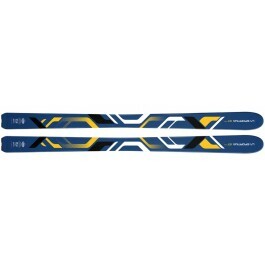 Lightweight ski touring skis, easy on the up and reliable on the descents. •	Construction: Karuba wood core with carbon. Softened tip and fusion sidewall. The La Sportiva GT is back in the range but lighter than ever at a mere 2 kgs per pair these 89mm wide touring platforms combine ascent focused weight with solid all mountain ski performance on the descents. With a 21m radius and a classic pure camber construction the GT 2.0 are designed to give you solid edge grip when you need it most, whether that's skiing wind blown boiler plate ice on an exposed col or following a steep skin track where slipping is not an option. They feature a softened tip which acts a little like a rocker helping to keep the tips up in soft snow and crud. The La Sportiva GT 2.0 make a great choice for people wanting a reliable touring tool for accessing the high mountains.